Bring a sense of illusion and wonder to your plants and flowers with our new Starburst Wind Spinner! 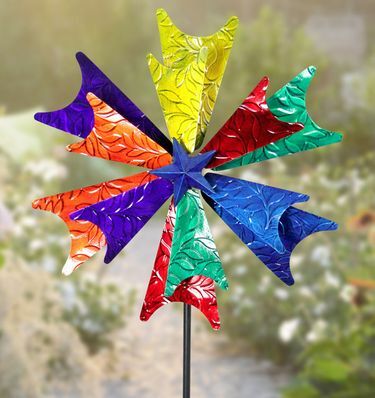 This Kinetic Wind Art Garden Spinner mounts easily in your garden and delivers plenty of color and motion! This eye-catching garden wind art sculpture presents a full bodied high-end look that you will love! This artfully crafted metal spinner has been designed with elegance and durability in mind, so that it truly showcases as garden art when standing perfectly still, and provides a visually stimulating effect when spinning in the breeze. Size: 18" x 18" x 78"H.